The Red Hot Mama (Gloria candens) was presumed to be extinct in 1966 with the passing of Sophie Tucker, who proclaimed herself the last of the breed. Fortunately, Nature (being a bit of a Red Hot Mama herself) abhors a vacuum and we are treated to an occasional specimen to cheer us and remind us that we are alive. 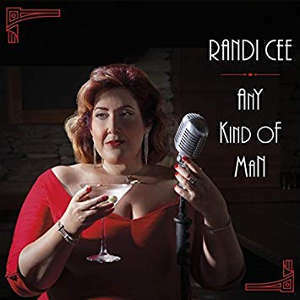 Randi Cee is a bona fide Red Hot Mama for the New Jazz Age, yet her incandescence is not the brush-fire growl of Ms. Tucker. There is more intense heat in depth and subtlety, and Any Kind of Man is geothermal. Ms. Cee doesn’t sound like anyone but herself, but while listening to her EP CD I could not help but think of Elsie Carlisle, who covered risque blues numbers for the English market. Ms. Carlisle transmuted the bald innuendo of Lizzie Miles’ “My Man o’ War” into high vocal art with her intelligent and elegant interpretation of the lyric—with absolutely no decrease in temperature. I feel similarly about Randi Cee’s version of the title track. Victoria Spivey recorded “Any-Kind-a-Man” [sic] for Vocalion in Chicago on October 15, 1936 accompanied by New Orleans jazzmen Lee Collins, Arnett Nelson, John Lindsay, and J.H. “Mr. Freddie” Shayne. With all due respect to the originator (and the original), Ms. Cee nails it and surpasses it, à la Carlisle. It doesn’t hurt a bit that she has the finest L.A. musicians on the session: John Reynolds on guitar, Katie Cavera on bass, Phil Krawzak on reeds, Corey Gemme on brass, Randy Woltz on keys, and Josh Collazo on traps. For “Bei Mir Bistu Shein” hot fiddler Benedikt Brydern joins the band, and Katie Cavera’s bass and Randy Woltz’s piano propel the number with palpable force. Randi Cee brings the lava again, and veers into perfect Yiddish after the verse. “After You’ve Gone” is a number I’ve long associated with Sophie Tucker, and Soph did it credit. So does Randi Cee. She croons (rather than belts) the Creamer and Layton warhorse with requisite aplomb. Guitarist John Reynolds takes a star turn here, demonstrating why he is in such demand on gigs and sessions on the West Coast. He solos seriously excellent acoustic jazz on his box. Phil Krawzak offers further delight on clarinet. “Bye Bye Blackbird” is a song fraught with subjective meaning for anyone who hears it. (It is rumored to express the weariness of a lady of the evening retiring from “the life” but it could just as easily be about an editor. “No one here can love or understand me,” indeed.) Ms. Cee highlights all the resonances of the piece with her thoughtful reading of the lyric. Messrs. Gemme, Woltz, and Reynolds all shine here, as well. Randi Cee concludes her debut EP with “You Made Me Love You.” She opens the selection with the rarely-heard second verse, emphasizing that this is certainly a song about grown-ups. It’s an astute choice. When you spend a lifetime searching for The One, it’s never who you think it’s going to be—and then you realize it couldn’t have been anyone else. Randi Cee blows all the dust off this 1913 chestnut and reveals it to be as modern and pertinent as your Facebook relationship status: “It’s complicated.” (People have always been complicated.) Corey Gemme channels Harry James through his horn, which is entirely appropriate to the occasion. A vocalist friend once told me, “All singing is acting.” Randi Cee has had a notable career as an actor and a dancer; you have certainly seen her in movies and on television. As such, she not only hits the notes and enunciates the words, but convinces you that she means them. I do wish Any Kind of Man were longer. After so many years, such a brief glimpse of the elusive Red Hot Mama is tantalizing. Even so, these five songs (which you will listen to repeatedly) beautifully showcase a talent that needs to be heard. This disc is also a superb audition demo I highly commend to festival and concert promoters. That’s a big hint. I’d love to see Randi Cee at your jazz festivals and clubs—and soon.